The section of land this barn and these outbuildings are built on was a C.P.R. quarter. Please click here and see Page 12 and here to learn more about C.P.R. Ready Made farms. It is believed that this property was first owned by Colonel Patrick J. Daly, CMG DSO, and Alice Ann (nee Knight) Daly, RRC. Patrick Joseph Daly was born in Dublin, Ireland on April 29th, 1872. He moved with his family to Australia in 1877, at the age of 5-years-old. He was the son of James Daly; later of Alstonville, Richmond River, New South Wales. He worked as a carpenter until the age of 29, when he set off to South Africa to serve in the Second Boer War. Patrick was a young cavalryman, a lancer, who served with the West Australia contingent (6th Western Australia Mounted Infantry) from 1901 to 1902. Patrick Daly departed from Fremantle, Western Australia on board the SS Ulstermore (click here for images) on April 10th, 1901 and arrived in Durban, South Africa on April 29th, 1901. He was promoted to Corporal from Private some time in 1901. From there he was “promoted to Sergeant by the Commander-in-Chief” Herbert Kitchener; 1st Earl Kitchener, “for gallant service done on three occasions with scouts, when parties of Boers were taken”. He advanced from Sergeant to Lieutenant on January 18th, 1902 for work done while present in operations within the Transvaal Colony and the Orange River Colony. Patrick Daly was then severely wounded at Roodepoort, South Africa on February 26th, 1902; he was shot seven times; including once in each wrist and several times in his thigh and calf. He was mentioned five times in Commander-in-Chief Despatches for his “services during the operations in South Africa” (London Gazette, 31 October 1902). He was nominated for the Victoria Cross and was awarded the D.S.O. (Distinguished Service Order) for, “rescuing a fellow solider under fire.” Patrick Daly was admitted to a Pretoria Hospital in February 1902 to treat his injuries. It was there that he met Miss Alice Knight, a highly esteemed nurse. Much like a Hollywood movie, the soldier fell in love with his nurse. Alice Knight, born in England, joined the nursing sisters of the British Army, the Royal Army Medical Corps, when she was 19 years old. After a few years of service, she was sent into a ranging war in South Africa in late 1901. The battle at Ladysmith, South Africa during the Second Boer War concluded with an excruciating four month period, where ever-increasing cases of enteric fever ran rampant and resources were precariously low. Alice was present throughout the entirety of this siege of Ladysmith. The town was besieged for 118 days and, towards the end of the struggle, city residents were living off of their working animals, oxen and horses. 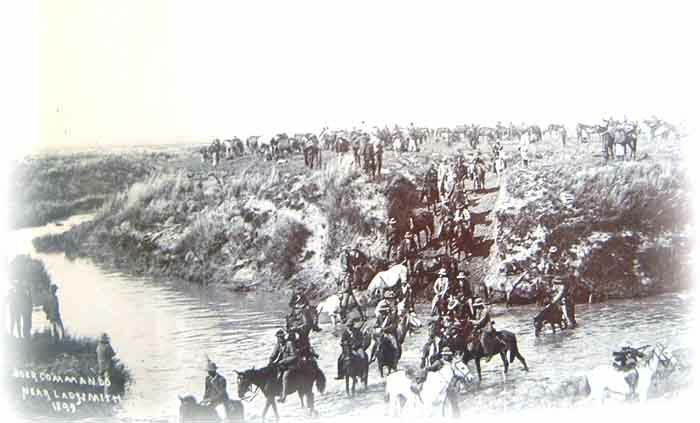 After securing Ladysmith, a retreat of the Boer troops in March of 1900 caused the British Army to advance onward to the North, pushing the Boer forces back. The more northerly city of Pretoria was surrendered to British forces on June 5th, 1900. The Second Boer War ended in Pretoria with the signing of the Peace of Vereeniging on May 31st, 1902. 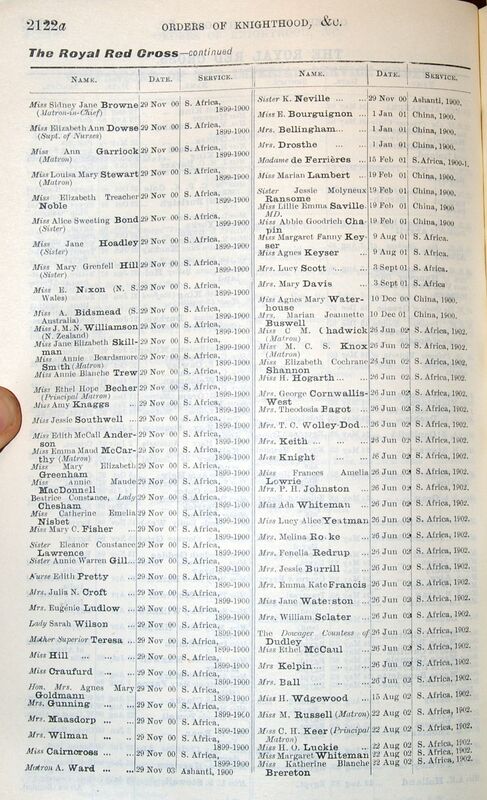 Alice was recognized in a London Gazette Despatch on Tuesday, June 17th, 1902 as a civilian nurse for “care of prisoners of war in Pretoria”. She would also receive the decoration of the Royal Red Cross, along with six other nurses, for “care of prisoners of war in Pretoria“. 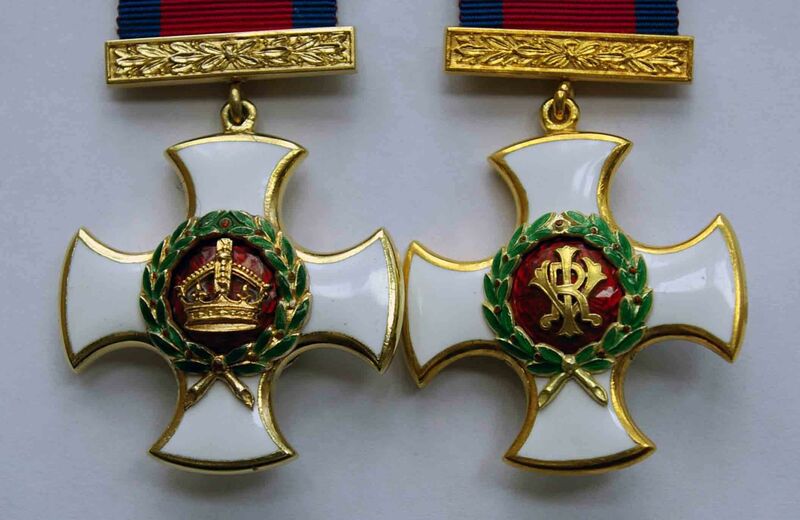 This award was administered on the 26th of June, 1902 for service in South Africa in the year 1902. Alice moved with the British forces to Pretoria to serve in the No. 22 General Hospital, formerly the Imperial Yeomanry Branch Hospital in Pretoria, where she would meet Patrick Daly. On May 28th, 1902, she would tend to a young cavalryman who had been subject to seven rifle shots. As stated earlier, the pair fell in love. The war was almost over and Alice was sent back to England only to secure her discharge and return to Capetown, South Africa; where she would wed Patrick Daly on March 17th, 1903. Patrick Daly ran government farms after the Boer War; he would scout land and was commissioned to raise horses in Transvaal for the government. The Dalys spent 1903-1910 in South Africa before moving to England. It was there, on September 30th, 1910, their only daughter Eileen was born. The family would move to Calgary, Alberta, Canada late in the year 1910. The pair owned a home at 711 12th Avenue West, Calgary, a two-minute walk from Beaulieu, or Lougheed House, and The Ranchmens Club. Interestingly enough, Patrick Daly would actually have his medals, received while in service with the Canadian Expeditionary Force, sent to the Club while he and Alice were away during World War I. While in Calgary, Patrick Daly began a partnership with Pat Burns, one of the Big Four; or founding members of the Calgary Stampede. Patrick and Alice Daly were very active in the Calgary community; it is believed that the Daly’s lawyer was The Right Honourable R.B. Bennett while he was in practice with Sir James Alexander Lougheed. Colonel Daly worked as a CPR land agent and would often assess land on their behalf; however, he would also help raise cattle on Burns’ ranches. It is also of note that the Dalys bought and sold land at the time and that Alice Daly had title on some of that land. This may have made her one of the first women to own property in the region. The Daly family owned two farms at this time; one in Strathmore, Alberta and one in Lougheed, Alberta; named after Sir James Alexander Lougheed. It is known that the land the Dalys lived on South of Lougheed was a CPR quarter. With the outbreak of World War I on August 14th, 1914, both Dalys met the call again and volunteered to serve in the war effort. Patrick began recruiting for the Canadian Expeditionary Force soon after war broke out. Then, in November of 1914, he joined the 31st Battalion, CEF at Calgary. Both he and Alice would see service in France but Alice would actually see battle long before her husband would. Meanwhile, Alice Daly recruited for the Canadian Expeditionary Force in Calgary. In August 1914, she was tasked with recruiting nineteen nurses and filled her quota within the day. She then volunteered to serve as a nurse overseas and headed for New York. Upon arriving there, she was told it would be four or five weeks before she and her counterpart, Mrs. L’Amy of Calgary, would be able to cross the Atlantic Ocean for Europe. However, the pair did not end up waiting anywhere near that long. Rumors of submarine attacks on passenger ships caused widespread ticket cancellations to pour into the steamship offices. As such, Mrs. Daly and Mrs. L’Amy were able to set sail for France on September 20th, 1914. Mrs. L’Amy’s husband, Lieutenant J.H. L’Amy, actually served alongside Colonel Patrick Daly while in the 31st Battalion. Alice would arrive a year before her husband, as the 6th Canadian Brigade of the 2nd Canadian Division did not land until October and November of 1915. She rented an apartment on the outskirts of London, England and setup shop there. During 1917 and 1918, Alice was proposed to have been stationed at Lady Astor’s Red Cross hospital, called the HRH Duchess of Connaught Hospital, close to Taplow, Buckinghamshire, England. When Colonel Daly arrived in Europe, she volunteered for service in France to be closer to him. Alice Daly was highly respected due to her service history and was posted closer to the action. It was said that while serving in France, a Big Bertha shell, fired from seventy miles away, went through the roof of her apartment building. She was lucky that she was away on duty and only had to experience the aftermath of the impact. Patrick Daly served in World War I from 1914 to 1919, rising to the rank of Full Colonel. On March 24th, 1917, Patrick Daly would receive the Order of St. Michael and St. George (CMG) (No. 2944). In 1918, Patrick Daly would command the 27th Battalion (City of Winnipeg), CEF and be given the rank of full Colonel. The 27th was part of the 2nd Division, 6th Infantry Brigade; along with its sisters 28th Battalion (Northwest), CEF; 29th Battalion (Vancouver), CEF; and 31st Battalion (Alberta), CEF). He would be placed on duty at Le Havre, Normandy, France and remain in France until after the Armistice. A German 8 inch Howitzer captured on Vimy Ridge by 27th Battalion, which Patrick Daly commanded. Alice Daly would pass away in August of 1930 from pneumonia contracted after a surgery for another illness. While in the Lougheed area, she was a staple. The town and district residents required her services whenever injured. Her loss was mourned greatly by the community. Many said that it took great knowledge, technical skill, tender hands, and a giving heart to help as she did. Col. Patrick Daly would pass away on February 12th, 1931 at 59 years old after an operation for appendicitis. He was taken to St. Anne’s Hospital in Hardisty on February 8th but complications took him in a couple of days. A military funeral was held in the Lougheed Roman Catholic Church. His horse, with an empty saddle having on top boots and spurs reversed, was led by Sergent A. Skyes behind the hearse. You can access Colonel Patrick J. Daly’s service record here. This frame shows a portion of the southern side of the house and most of the eastern side of the house. Most of the structure is obscured by maple trees. This frame shows the eastern side of the house, which would have been the kitchen and pantry area. This frame shows the eastern side of the house from a more northerly aspect. This frame shows the western and northern sides of the house. This frame shows the northern side of the house. This frame shows the western side of the house. This frame shows the front porch on the south-western side of the house. This frame shows the southern side of the shed addition on the eastern side of the house. The addition makes the sitting room near the inside staircase more spacious. The wall in this frame is the southern wall. This frame shows the southern side of the house above the porch. This frame shows the staircase to the second floor of the house. The staircase is positioned just off the entryway from the porch. This frame shows the northern wall inside the sitting room with the shed addition. This frame shows the north-eastern corner of the shed addition. This frame shows the eastern wall of the shed addition and the house. This frame shows the northern wall of another sitting room on the first floor of the home. This frame shows the same sitting room. The walls in this photo are on the western side of the house. This frame shows a second entry into the home from the porch. The staircase for the home is on the other side of the wall on the left side of this frame. The door and window are built into the southern wall of the house. This frame shows the south-western corner of another sitting room. The window in this frame is in the western wall of the house. This frame shows the window in one of the rooms on the eastern side of the house on the first floor. This room was most likely a dining room. This frame shows the same room as the frame before. Through the doorway on the left side of this frame (to the North) is a room which was probably the kitchen followed by a small pantry or storage room. This frame shows a bedroom on the second floor of the house. The window in this frame is the second floor window on the western side of the house. This frame shows one of the closets in the house. They were all quite small. The hole in the wall next to the closet would have been for heating system. This frame shows the other end of the western bedroom on the second floor. The top of the staircase is visible just outside the brown door. Another closet is in the background on the left side of this frame. This frame shows the basement inside the house. The basement is only under the south-western portion of the house. This frame shows the staircase down into the basement. The two staircases are in the same position in the house. To the left (West) of the staircase in this frame is another room in the basement. This frame shows the entrance to an underground cellar that is on the property too. The cellar was hand-dug and used to keep preserves cold all year. The roof over the entrance to the cellar is made of large timbers laid parallel to the door in a line. Dirt was then shaped to cover the logs. This stabilized the entrance and stopped cave-ins. Decorations: No names of dates, white paint around windows and doors. This house is not the only structure on this property. Treaty Hill is home to this house, outbuildings and a barn, and some Geodetic Survey markers. Colonel Patrick J. Daly, C.M.G., D.S.O. No Author. “Colonel Patrick J. Daly, C.M.G., D.S.O.”. Verdant Valleys In and Around Lougheed. 1st ed. Lougheed: Lougheed Women’s Institute, 1972. Print. Alcorn, Phyllis. “Col. Daly Family”. In the Bend of the Battle: A History of Alliance and District. 1st ed. Alliance: Alliance Lions Club, 1976. Print. Alcorn, Phyllis. “Col. P.J. Daly”. In the Bend of the Battle; THE NEXT GENERATION: A History of Alliance and District. 1st ed. Edmonton: Douglas Printing, 2005. Print.